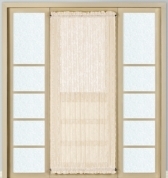 We carry a large selection of top quality lace and sheer door panels at everyday low prices. Save an additional 10% off to celebrate our totally redesigned website. Linens4Less.com is your source for door panels in hard to find sizes. Remember to measure and hang door panels as far apart as you can since door panels look best when pulled taut. The stated size is measured from the top of the top rod to the bottom of the bottom rod. Our selection includes lace door panels, sheer door panels, batiste door panels and semi-sheer door panels from top brands like Lorraine Home Fashions, HCI Curtain and United Curtain.